For those of you who have ever encountered a gooseneck kettle, the first question to your mind may well be “what on earth is that”. Here we will review some of the best gooseneck kettles available on the market. First though, let’s identify a few key points about this type of kettle and its uses. What is a Gooseneck Kettle and what’s special about it? A gooseneck kettle, also known as a pour over kettle, is as the name suggests, often used in preparation of pour over coffee. It features a long and narrow spout. 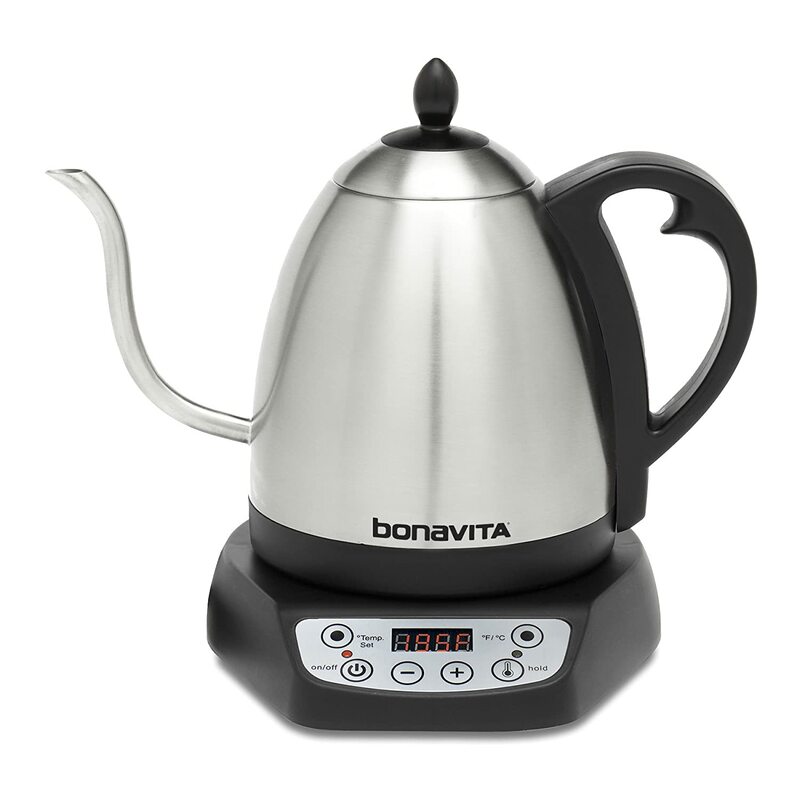 This features sharply distinguishes it from other types of kettle. The main purpose of a gooseneck kettle is two-fold. The first is to give the user a high degree of control over the speed of the water. The bended neck also helps to slow down the flow of the water. This is essential in the preparation of pour-over coffee where the water must be poured slowly and in a circular fashion for optimal results. The spout also lets you laser-target(well, sort of) where the water falls. To make perfect pour over coffee, you need to have as much control over the saturation of the water and coffee as possible, so the more accuracy you have, the better. One way to get more accuracy than a gooseneck kettle would be just to use an eyedropper or a syringe! Secondly, the handle design of a gooseneck kettle is specifically tailored to allow a full hands-on grip to the user. As well as providing comfort during pouring, the degree of flexibility is increased. 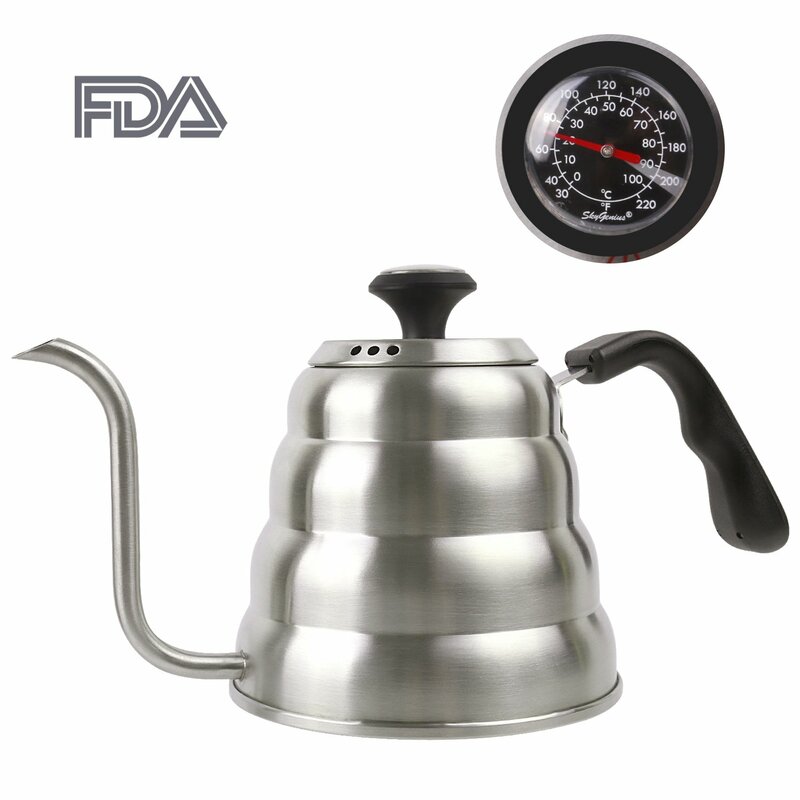 The user can have full control over the kettles positioning without any danger of touching the hot kettle. There are both manual and electrical varieties of gooseneck kettle which we will review. Manual kettles are of course simpler to operate and usually come with no method of measuring the current water temperature other than the user’s best estimations. Note: A hack for if your kettle does not have a thermometer is to let the water rest off of the heat after boiling for 30 seconds to 45 seconds. In this much time, water usually will drop down to the 195 degrees celcius required to brew great coffee. Electrical gooseneck kettles on the other hand, can often be pre-set to boil at a certain temperature to produce the best possible results. For the purpose of this review, we will take a closer look at the best from both categories. The first in our review of the best available Gooseneck kettles is one of the most popular consumer choices. The SkyGenius kettle represents everything that is positive about buying a gooseneck pour over. The temperature of the water can be accurately monitored with the clear and precise gauge features on the lid. Unlike many others, the gauge on the SkyGenius also does not steam up. This effectively means that you can ensure the perfect temperature every time. This sort of precision is very difficult with some other manual kettles. It is a very durable kettle. The SkyGenius features a triple layered base. This means that it should stay resistant to rust for many years, even decades. This type of long lasting durability means that this model represents a fantastic value investment. This model has been designed and welding to the highest level specifications. This quality process ensures that the kettle lid does not become displaced during pouring. This is a vital safety element as well as helping guarantee there will be no accidental spillage along the way. As far as manual gooseneck kettles go, the SkyGenius is a fantastic all round purchase. It is also sure to have a long lifespan. Support audio + charging + control pause playback + iOS 10.3 / 11.4 or higher: support audio output. Perfect for iPhone X, iPhone 8/8 Plus. iPhone 7/7, this adapter allows you to connect your device with an audio plug to a lightning device, a perfect solution for music while you're charging. Next in the review of manual gooseneck kettles is this top of the range offering from Coffee Gator. Constructed with the highest degree of care and attention, this model is commonly referred to as the “Lamborghini of kettles”. This model comes in two variations. Both the 1l and the 1.2l versions are available. These are standard kettle sizes which provide for several cups of your favorite pour over coffee. The handy temperature gauge on the lid of this stainless steel model provides the user with the most accurate possible information in regard to the temperature. This information is all the more key in gooseneck kettles since the process of making the best pour over coffee incorporates so much precision. Overheating the water is likely to scorch the beans and reduce the overall taste quality. For this reason, the build quality is so important when purchasing a gooseneck kettle. Finally, Coffee Gator offer a generous money back guarantee on all of their models. This speaks volumes about their belief in the product. This offer should also extend to boosting consumer confidence. First up in our review of the best electrical gooseneck kettles is one of the most popular among users. The Bonavita digital model is one of the leading products in the field. 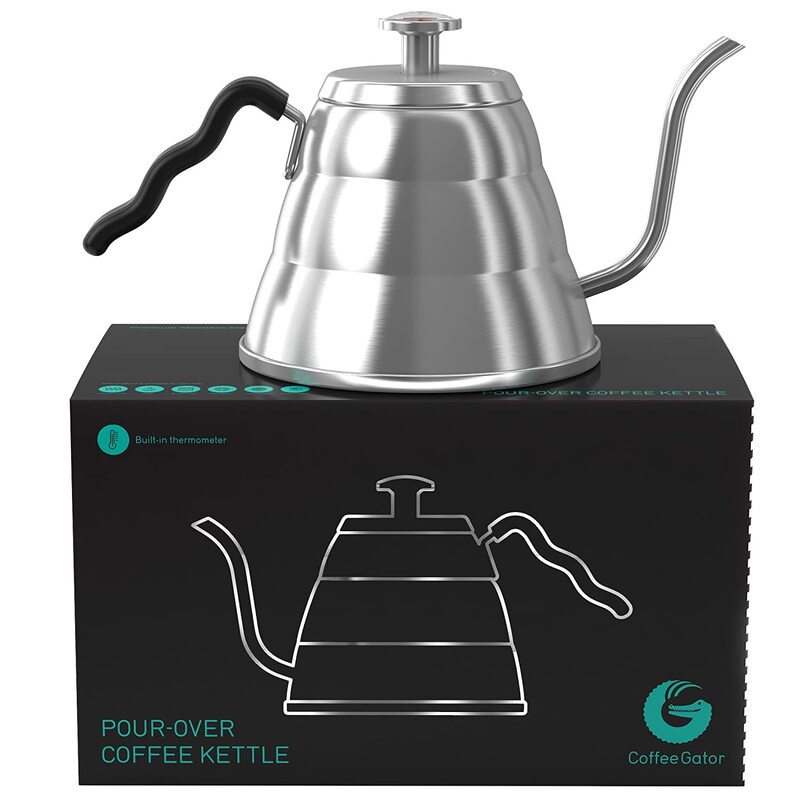 This is for great reason, its variety of features make this a must have device for anyone who is serious about owning a gooseneck kettle. It comes in both standard sized 1l and large sized 1.7l variations. This provides you with ample space to make coffees for the entire family. The adjustable temperature gauge which allows for setting at one degree intervals between 140-212 degrees means you can program the water to be at just the correct temperature to ensure perfect results. The 60 minute heat and hold feature means that you can also be busy with other things and know that your coffee will still be waiting for you at the perfect moment and heat. The ease of the brewing process is further supplemented by the presence of a digital timer display which can show both the time and the current temperature of the water with great accuracy. The fact that this model also comes complete with a one-year warranty means you can rest safely in the knowledge that the company has you fully supported in the event of any problems. 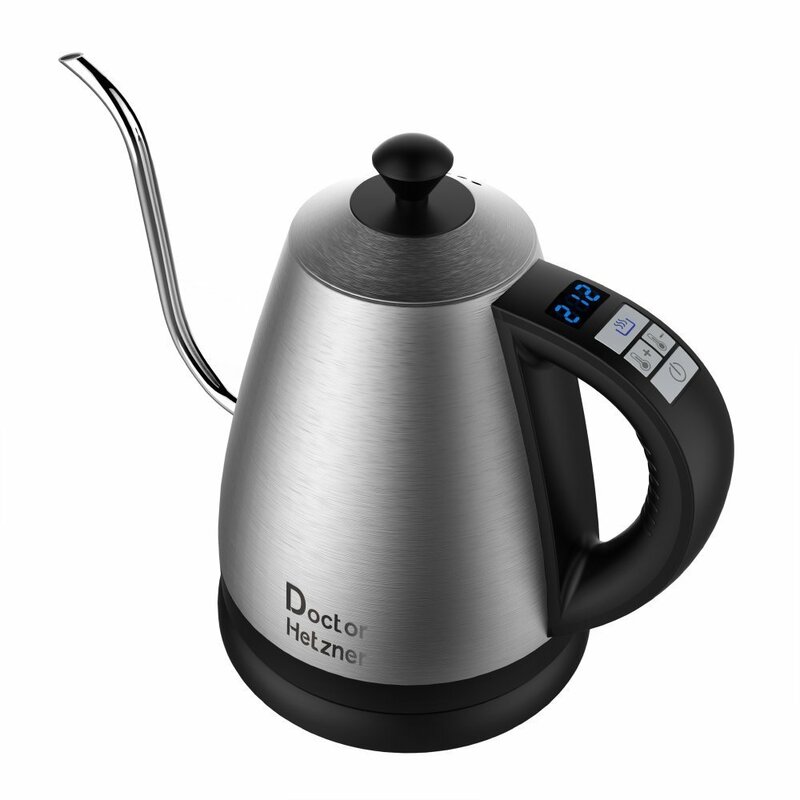 Next up in our comprehensive review of the best gooseneck kettles available on the market is this model from Doctor Hetzner. It is a very sleek and stylish, modern electric gooseneck with a variety of useful features. Besides the expected features such as being constructed from food safe and durable stainless steel, this is one of the first models of its kind to feature preset temperature controls. This allows you to have a minimal approach when it comes to preparing the perfect temperature water for your pour-over. By eliminating the guesswork and even providing a stylish and modern digital display on the handle, this gooseneck makes sure that your coffee will be perfect time and again. The temperature control can also be varied in measures of one degree up to a maximum of 212 degrees. These features along with the powerful 1,000Watt output of this model mean it can boil a full kettle of water in only 6 minutes. The fact that the company trust the product enough to not only offer a two-year guarantee, but also a 30 day, no reason guarantee is a testament to customer satisfaction and overall product quality. 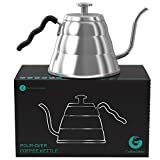 Last but not least in our review series of the best gooseneck kettles is this stylish and efficient model from Gourmia. The GPK610 comes in two sleek variants. 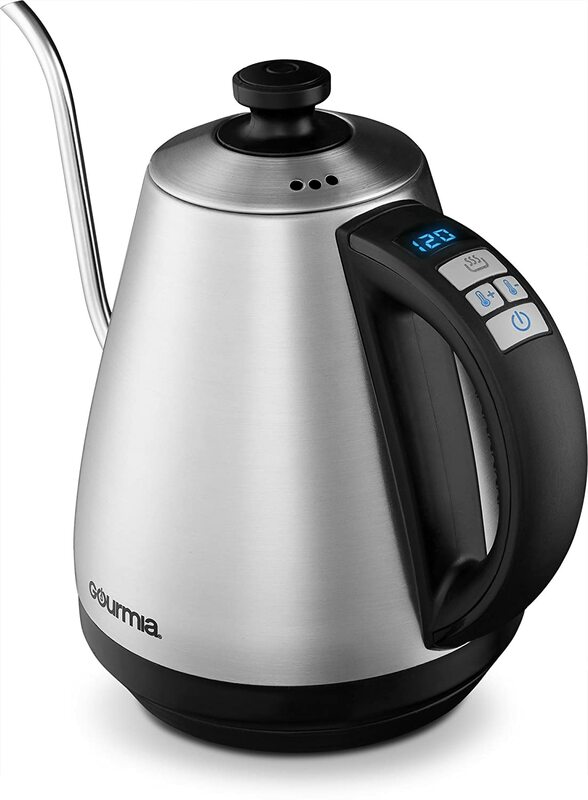 One features a digital display on the handle of the stainless steel 1l kettle. The other meanwhile, moves the digital display on to the base of the power stand. Both give this model a slick modern edge. These functions allow you to delicately adjust the temperature of the water by a single degree at a time. This allows for the perfect temperature to be reached for enjoying your pour over with minimal fuss. The model also allows for the water temperature to be held at a constant heat in case you find yourself distracted or like to prepare for later. In an ever competitive market, this is the ideal combination of style and efficiency. This model will sit proudly in almost all modern kitchens. There are a few factors that make the difference between a good gooseneck kettle and a great gooseneck kettle. Let’s have a look. 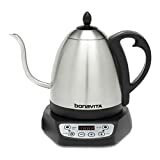 By and large, most gooseneck kettles come in the 1 liter variety, which should be enough for brewing up to three cups of coffee at a single time(technically you can brew 4, too, since 1 liter is roughly one quart and one quart is 4 cups). It really depends on how many people you wish to brew for at once. If you want to serve a large gathering of your friends and family at once it may be easier to get a bigger kettle so you can brew it all in one go. The adage “you get what you pay for” is certainly true for gooseneck kettles, too. This is a hot water kettle, and heat, water, and metals usually equal rust, unless you’ve got high quality stainless steel. Any rusting will most definitely ruin your brewing experience so please get a kettle made with high quality metal. Lower quality metals will corrode much faster, and not only will that mess up the finish of the kettle, but also its capacity to retain and conduct heat, and its overall strength, too. Depending on how the spout is shaped both on the outside and at the joint into the kettle, the water will either flow out of it smoothly or it will have a tendency to splash around. The key to making good pour over coffee is to slowly, evenly extract the flavors from it, so uneven pouring or splashing will certainly mess that up. So it’s not really a matter of how fast the water can flow from the spout, but a matter of how consistently it can do so. There’s a reason drip coffee makers take so long to brew, which is that the water must drip at a consistent rate to extract the most flavor. To achieve the same result with pour over, you need to pour slowly, consistently, and over a bit of time. Since we’re pouring the coffee slowly by hand, you need to pour slowly and evenly. As a result, you want to have a really comfortable grip on your kettle so the grip design, material, and comfort is certainly something to consider before buying. Whether you prefer the traditional style manual gooseneck or the more modern electrical versions with preset temperature controls and heat preserving features, there is no doubt that to best enjoy your pour over coffee how it was intended, the gooseneck is a vital component. Hopefully, review of these most popular model can help ease the burden of your purchasing decision. If you have any other questions or appliance decisions to make, feel free to peruse our other articles which are also full of useful reviews and advice.